A very beautiful and long circuit takes you to the new villages of the Strasbourg Eurometropolis and the gateway to Molsheim. 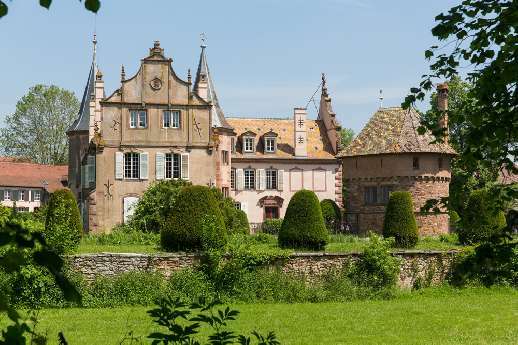 With the Bruche Canal as your faithful sidekick, you will discover the châteaux and gardens of Kolbsheim and Osthoffen, cycle along the vineyards of the famous Golden Crown and admire the myriad panoramic views of the Plain of Alsace. Leave place de l’Etoile heading towards Montagne Verte and cross the Heyritz Gardens. Follow the Montagne Verte sign and then Eckbolsheim, Wolfisheim, Oberschaeffolsheim and Achenheim along the Bruche Canal up to Kolbsheim. Take the D111 road to Kolbsheim and by the village townhall (Mairie) turn left into rue de la Division Leclerc, which will take you up to the château, then turn right into rue des Noyers. Cycling past an old water tower, keep going straight along the D174 for 1 km (viewpoint) and then turn right onto the D45 going towards Breuschwickersheim. After 350 m, turn onto the farm track on your left, which you then follow for 800 m. Turn left when you arrive at the D118 and continue until you reach Osthoffen. 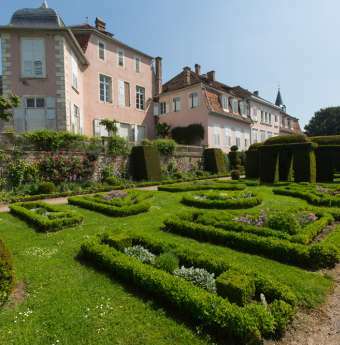 Once in the village, take the 1st left (with the sign Centre – Château) and follow the main road round to the château. At the end of rue du château, turn right, following the Toutes directions sign and then Handschuheim . Take the D718 and when you arrive at Handschuheim, turn right into rue du Laegert. Keep going straight, along the farm track for 2 km, the track is asphalted at the start before becoming a dirt track. You will have an excellent view over the Vosges, the Black Forest and Strasbourg Cathedral. When you reach the fork at the end of the road, turn left and then right on to an asphalted road. Be careful of the sharp downward slope. Take the 2nd left, a dirt track, for 800 m and you arrive in Breuschwickersheim. Turn left into rue Principale, then turn right by the village townhall (Mairie) into rue du Moulin. At the end of the road, turn left into chemin du Schwall and then left again into rue de Hangenbieten. After admiring the château, join the D45, turning right and then follow the road until Achenheim. When you arrive at the village, turn right onto the D222, until you reach the Bruche canal, where you turn left to eventually arrive in Strasbourg. Caution: This itinerary includes country paths that require all-terrain bikes for an overall distance of less than 4 km. The paths are not dangerous but require a minimum of comfort for cycling on rough earth, pebbles, avoiding ruts and puddles and, depending on the weather, cycling in mud. This “untouched” side will appeal to some cyclists. If you are looking for a smoother option, then avoid the section between Handschuheim and Breuschwickersheim. Instead, once you have reached Osthoffen, we advise you to go to Breuschwickersheim directly by road (D 118).